"For A Night To Remember"
My company has been delivering a premium showcase disco for many years, providing mobile disco karaoke entertainment for weddings, birthdays, anniversaries and promotional events for over 25 years, evidenced by our many, many satisfied and grateful customers. 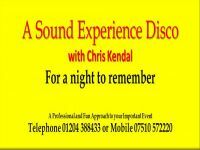 A Sound Experience Disco, prides itself on putting the customer first. Which means we help you get the party you want, so you can relax and enjoy your party event. Required by many venues, A Sound Experience Disco has a current PLI policy with AMP DJ in the amount of £10 million. Also required by many venues, A Sound Experience Disco has supplied satisfactory evidence of holding current PAT inspections of their equipment dated within the last 12 months. A Method Statement, outlining A Sound Experience Disco&apos;s Health & Safety procedure for setting up disco equipment has not been supplied. Why do people choose to book A Sound Experience Disco? "chris did a great job, with a very mixed crowd, think he managed to keep everyone happy , great job, would recommend"
"Thank you so much for your kind words it was an exciting crowd and thoroughly enjoy myself and hope and friends enjoyed themselves thank you"
"Great feedback from the party guests all said great DJ"
"Thank you so much for your kind words I really enjoyed myself Great Great Night"
"You cannot get much better than Chris Kendal he is a top professional and very friendly and accommodating. He did everything he said he would and more! Nothing was a problem and he looked well after the children entertaining them whilst keeping the adults happy! In my opinion I would not use anyone else now. Thanks for a great night Chris. Jim "
A Sound Experience Disco also offers a range of additional party services not directly linked to musical entertainment. Get FREE no-obligation disco quotes from A Sound Experience Disco and other DJs covering your venue. Take 2 minutes to fill in some basic details and we'll do the rest! If you are contacting A Sound Experience Disco about an event, it's always a good idea to include the DATE, LOCATION, EVENT TYPE, AGE GROUP and TIMINGS to speed things up!